Quality design and installation must go in before the name goes on. We are committed to providing our customers with high-quality systems that will stand the test of time. When you call Ray Heating and Air Conditioning, you will receive service from a reliable technician who is trained and certified in the latest technologies. We have over 30 years combined experience in a wide variety of applications.All installation and service technicians are licensed and bonded. 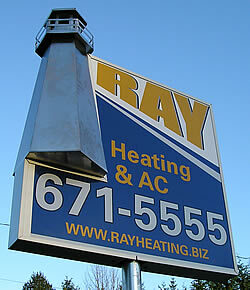 At Ray Heating & A/C we understand deadlines and construction schedules. We also understand the inconvenience that occurs when a job is not completed on-time. That’s why we are committed to providing timely and efficient service to insure you meet your deadline. To give glory to Jesus Christ by providing legendary service and heating/cooling systems for customers and contractors at reasonable prices. RAY: 1. A) A beam of light that appears to come from a bright source. B) a graphic representation of the above. 2. Any of several lines radiating from a center point. 3. A disclosure of mental or spiritual enlightenment: as, a ray of intelligence. 4. A tiny amount; slight trace, as in “a ray of hope.” V.I. To shine forth in rays; to radiate. V.T. To send out in rays; emit.